Sweet peas. One of my favorite flowers in the world. I love them so much. We used to have vines of them trained along the stairs when I lived in Oregon once upon a time. Simple, fragrant, perfectly happy-making. Today was our first foray out to the South Pasadena Farmer’s Market and I was very impressed. What a great little market, tucked away in the little park adjacent to the Gold Line tracks. We found fresh berries, bunches of sweet carrots, beets, tender baby leeks, Italian basil, red plum tomatoes, tiny asparagus stalks and bags of sugar peas. I wanted to buy one of everything! Bread, kettle corn, soap, Indian food, the tamale vendor (we had to stop at the tamale vendor for sweet corn tamales in tomatillo salsa), an apple cart, it was really just a simple pleasure to walk around in the sunshine, smile at little kids and enjoy the community. It is a real party atmosphere. I adore South Pasadena. Oh I so wish I’d brought my camera. I’ll have to do that next week. Tonight I’ll toss that fragrant basil and a few of those plum tomatoes chopped up with some pasta and good olive oil and we’ll offer up thanks for the bounty of spring! 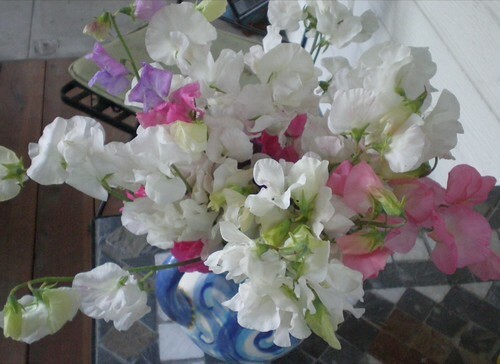 I absolutely adore sweet peas! I couldnt get them to grow when I lived in GA, but I will try them now that I am in CO. BTW, it is snowing here today. I have missed visiting you hear lately. Lost all my links when I changed computers.